A huge thank you to everyone who is sharing their feedback with us. We pay attention to every single feature request sent to us, and while we cannot implement all the wonderful feature ideas you guys come up with, we do our best to include the most popular ones. Here are the freshly released features requested by our customers. Share your mockups, moodboards, Facebook-photo, or any other image with your client. 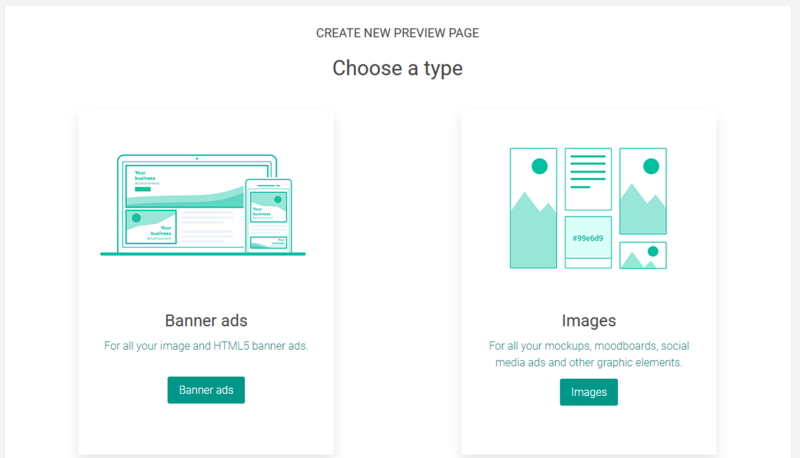 Create a new preview page and choose between a preview page for your banner ads (as you have right now) or for your images (new). Mostly the same as preview pages for banner ads, but we won’t communicate the words ‘banner’ and ‘ad’ to your client for example. Sometimes you only want to show an overview of all ads (or images … ) on one page. No need to have pages for individual sizes. Well, we’ve got you covered. The settings of the preview page will allow you to define the Page setup. There’s more to do with Page setup. Don’t you want to have all ads on one page (because of performance for example), you can hide. No longer prefer the grid view with all ads next to each other? Let’s switch to one centered column, to show all ads (or images…) just below each other. We love our customers that serve a lot of clients with our platform. We’ve optimized the dropdowns to select a client or ad set, so you can easily filter the client you’re looking for. Where can I find all these new features…? Login to the platform and create a new preview page. You will find all 4 new features in the upload wizard.